What is this? A close-up of a newly discovered planet or asteroid? Sadly, no. It is a 15-ton lump blocking all but 5% of the sewer line beneath a road in Kingston, South West London. The congealed mass – the size of a bus – contained rotting food and other debris. The water authority has issued a plea for residents to avoid disposing of fat and sanitary wipes through their drains, which could have led to sewage flooding homes and businesses and spewing up into the streets. Supervisor Gordon Hailwood with Thames Water remarks, "While we've removed greater volumes of fat from under central London in the past, we've never seen a single, congealed lump of lard this big clogging our sewers before." Given that the city's sewers are the largest, the workers believe that the deposit is the most enormous in British history. 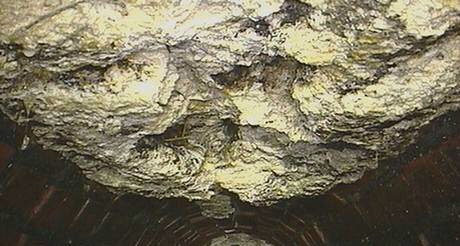 In the same month that the Discovery Channel has aired "Sharknado," and we're told that a "gustnado" is a legitimate weather phenomenon, we learn that this disaster waiting to happen has been dubbed a "fatberg."